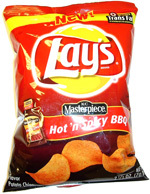 Taste test: These were regular Lay's potato chips with the KC Masterpiece Hot 'n Spicy style barbecue powder on them. They tasted like the regular barbecue version, but with enough of a heat kick to make the mouth burn slightly when eating them. Eating one of these chips isn't going to make you run to a water fountain to cool your mouth down, but after three or four of the chips, your tongue will start to feel a nice spicy chip kind of burn. 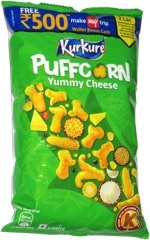 Personally, I prefer a sweeter style of barbecue chip, but if you're a fan of the spicy variety, these chips are fine. Smell test: Barbecue powder wafts up from the bag.